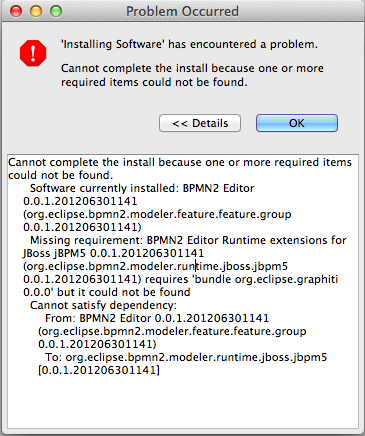 I tried to install new eclipse editor using the update site given in http://docs.jboss.org/jbpm/v5.3/userguide/ch.eclipse-bpmn-plugin.html (referred from the featured discussion https://community.jboss.org/thread/200179). I'm using eclipse indigo on MacOS X 10.7.4. I get the following error. Could you guide me how to get this fixed? Yes, I was getting the same error. I found that if I install the BPMN 2.0 Model Editor first then the missing dependency is resolved. The nightly update site is <http://hudson.eclipse.org/hudson/job/bpmn2-nightly/ws/org.eclipse.bpmn2.site/target/site>.